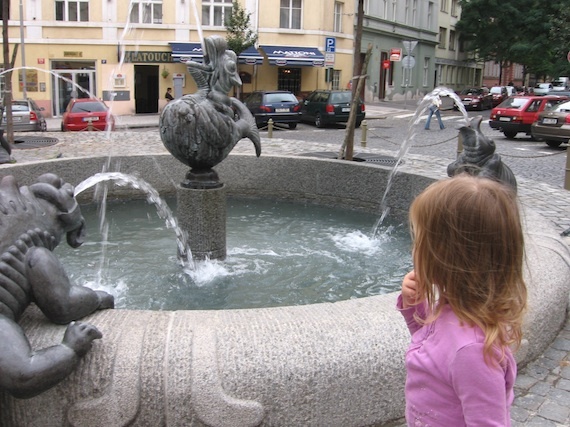 Blatouch was a favourite of ours when for years it was located in the Jewish Quarter of Prague. One could be guaranteed good service, nice food and a laid back atmosphere. 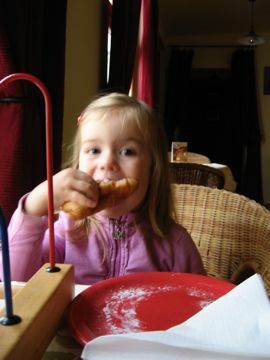 Little has changed with the cafe moving to Vinohrady, in fact things have vastly improved especially if one now has kids. Blatouch is in a great location facing right onto the square featuring a bizzare but sweet fish fountain right where Americka and Zahrebska Streets cross. The cafe is fortunate to face south so receives much of the morning sun, perfect if you are seated at one of their comfy outdoor tables. 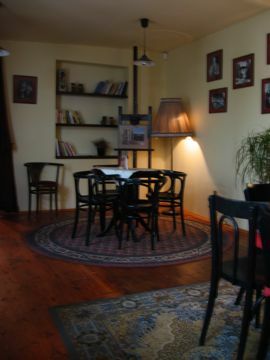 Indoors you will find two generous and pleasantly furnished rooms full of antiques and quirky paintings. It’s an old school Czech Cafe, the style of which I adore. The back room is set aside for non-smokers and those with kids, it’s intimately lit and faces onto a small courtyard. There are several large tables (one with a huge antique couch) as well as smaller tables - I mention this as I think it has potential as a great venue for Mothers Groups with young babies or quiet kids (not so much for boisterous toddlers). In one corner there are pencils and paper that kids can take to their tables, a basket of toys, one highchair and in the corridor there is a book shelf full of board games (suitable for older children or adults). You get the feeling that you can park there all day and no one will make a fuss. The back room is especially quiet and would be an ideal place to breast feed young babies in comfort and relative privacy although please note there are no baby changing facilities on the premises. There is however, free Wi-Fi for customers who need to work from their laptops, so if you have a child-free day and need a quiet place to work, this venue is hard to beat. Blatouch’s menu is reasonably priced, varied and healthy. They serve breakfast, soups, salads, bagettes, toasted sandwiches, pasta, baked vegetable dishes, tortillas and pita bread sandwiches and a large selection of deserts as well as the usual range of drinks. OPEN: Monday to Thursdays 10am till midnight, Friday 10am till 1am, Saturday 11am till 1am, Sunday from 11am till midnight. DIRECTIONS: Take the green line A to Namesti Miru metro stop or tram numbers 4, 10, 16, 22, or 23 to Namesti Miru tram stop. Parking is difficult in this part of town but there should be paid parking areas within this block of streets.